It was regarding people held in these rooms that large protests erupted at airports across the US: 10,000 reported in Seattle, similar numbers at SFO and O’Hare. The epicenter however was at John F. Kennedy International in New York, where the protest began. At least two Iraqi refugees were being held upon attempting to enter the country, per the previous day’s “travel ban”: an Executive Order halting immigration from seven nations which supposedly issue forth, in the perfervid imaginings of the world’s most powerful nitwit, a Muslim threat. The Executive Order further prevented green card holders from those countries from reentering the US, should they have left. Borders were snapping shut. Protestors descended with remarkable swiftness on Terminal Four, and then on the walkway outside, the tiered parking garage, the AirTran passage. Taxi drivers called for a work stoppage at the airport. Police tried to stop protestors from entering the terminal, from using the AirTran, from coming by subway through Howard Beach, all with little success. Finally a judge in Brooklyn and then one in Chicago issued stays against full implementation of the order; the people who were already en route could not be deported. Some detainees were freed; as of this writing it is not clear who is still captive. Nonetheless there was real jubilation at the granting of the stay, at each release, at the crowd’s somewhat surprised recognition of its own scope. A friend texted to say they were on the verge of tears. It is apparent that this limited victory for large and largely spontaneous activist response is a registration of the unexpected velocity at which Trump’s nativist ambitions are racing. Saturday night was as filled with hope for a nascent political response as late January has been saturated with fear. It is worth saying that the previous administration’s policies on immigration, and on Muslims, were less than admirable. Mass deportation and extrajudicial assassination set the tone. To the extent that the protests have oriented themselves toward a renewed Democratic Party power, they are hard to parse. 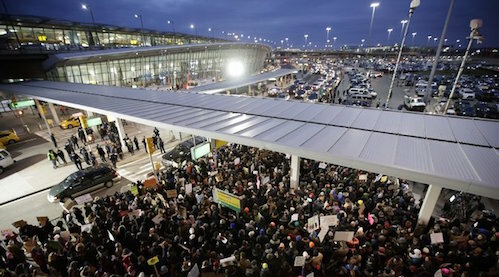 Many signs at the airports suggested that the Executive Order was unAmerican, against all evidence. It is impossible to want a do-over of the election and also want Muslims and many others to be free from threat of deportation, arbitrary arrest, and death from above. Moreover, a nationalist appeal corresponds to a distinction between “good Muslims” who wish to assimilate to American ways, and “bad Muslims” who do not. This is a fatal vision that will set up some as targets so others can pass through customs. Patriotism and free movement are unhappy bedmates. This contradiction on the side of anti-Trump forces is likely to develop further. It is also worth pausing over the obvious: the fact and thematic of border closures, so exemplary of Trump’s political project, is hardly his innovation. It increasingly appears as the fundamental political issue of the 21st century. The linchpin of Brexit, it has also been the subject of elaborate maneuverings throughout Europe, include the telling agreement by which refugees arriving in Greece or Italy would be sent back to Turkey in return for Brussels’ greater control over the frontiers. The EU, the UK, the US: all are narrowing their apertures for immigration. Terrorism is a preferred alibi, alongside vaguely Malthusian panic. An exhaustion with subordination to global policies seeming to originate elsewhere is palpable; xenophobia a constant thrum, which every vote and policy shift seeks to embolden. Economics are impossible to escape. Caught between high productivity and low profitability, the capacity to absorb labor in the core economies is not what it used to be. Which brings us back to FedEx and refugees and their relationship. The rise of FedEx is the fall of manufacture and industry in the leading economies, almost precisely; weakness developing in the sixties drops off a cliff in 1973. Capital increasingly shifts its quest for profits into the realm of circulation, finance, transport. Workers shift there if they can find any foothold whatsoever within the new economy. We see a burgeoning production of non-production — of surplus capacity and surplus populations, unable to be brought together and productively employed. On the one hand, more and more of capital’s churn depends on the global scope and velocity of circulation; on the other, more and more people are market dependent without the forlorn opportunity to become wage dependent. They too are cast into circulation. 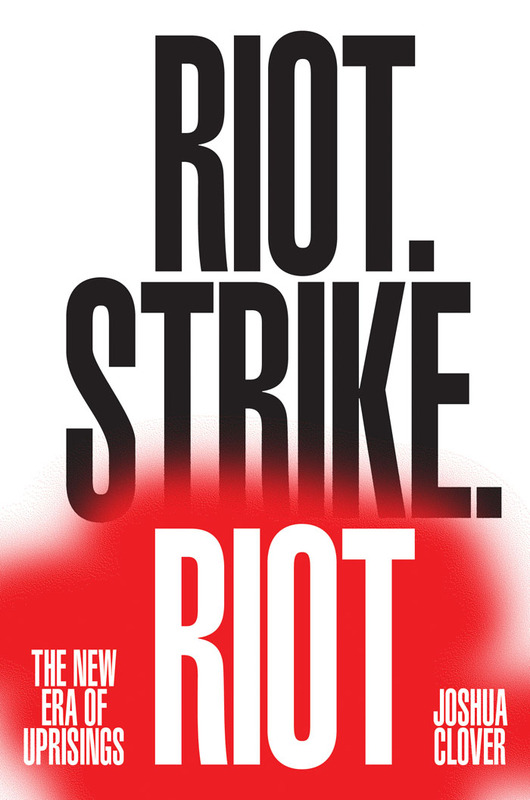 This is more or less what Riot.Strike.Riot is about: riots, but more saliently the rise of “circulation struggles.” These are the varied kinds of social conflict that come to the fore when the production struggles that predominated in the age of workers’ movements wane. The power of the traditional strike that denies the boss his profits has been, by and large, an artifact of an expansionary capitalism. When the economy goes zero-sum or starts to contract, the pressure shifts elsewhere, and it is elsewhere that social antagonisms manifest. This is not say that that anyone wakes up in the morning and thinks to themselves, “today is a good day for a circulation struggle!” What it means is that the rearrangements of bodies and economies and political frameworks pushes confrontations more forcefully toward some places and situations than others. One hardly needs to recount those who blocked highways across the US in 2014, against a state policy of killing black kids when not jailing them — a way to manage an already racialized population rendered surplus mostly by deindustrialization. There must have been a mutual recognition with Mexico last month, when privatization of national oil and corresponding price increases spurred el Gasolinazo, based in widespread road blockages. Neither moment invented this tactic, most popular in the medieval and early modern eras as the world market opened. It is revenant, to be sure. In Indiana last week, State Bill 285 proposed to require public officials to “dispatch all available law enforcement officers … with directions to use any means necessary to clear the roads of the persons unlawfully obstructing vehicular traffic.” This is inseparable from the circumstance of refugees, immigrants, travelers; for all its ethical power, this is also a story of surplus. Struggles we might place under the uncertain rubric of “human rights” and those of economic combat now look more or less the same. The refugees fleeing Syria, e.g., are driven by civil war, destruction of homes, drought, social collapse; a European economy unable to absorb any workers means refugees will be stranded in transit and in public, encamped in the plazas of cities and outside them, trying to get somewhere else. The global circulation of goods is matched by this flow of bodies. The question of borders increasingly appears as a contradiction between the free flow of capital and brutal limitations on humans. The flashpoints are places of transit. The camp at Calais, the Mediterranean coast. Frontiers, bus and train stations, ports, airports. Trump’s Executive Order takes it significance both from rising nativism’s racial hatred, and from this political-economic trajectory. They are one fist, dripping blood. It is certain that these will continue to be points of rising antagonism. The most dramatic event of Occupy in the US was the blockade of the Oakland Port, about 25,000 strong. Two months later, planning another march, they threatened to shut down the Oakland airport. The FedEx center haunted discussions. It was broadly held within and without the movement that this was suicide, figuratively if not literally; that no one would be sympathetic, that Homeland Security cops would shoot to kill if crucial circulation infrastructure was threatened. Yesterday was the fifth anniversary of this march, as a friend reminded me. Airports are now sites of open confrontations, a development presaged by Black Lives Matter protests at London Airport and others last year. The horizons for struggle are shifting. Ideas of how to fight back develop alongside the transformations of the world. The political question, however, is not reducible to tactics. It is in some regard one of finding a unity. It is inarguable that the travelers detained last night, hauled into some tawdry and terrifying back room behind a grotesque commandment from the Head Cracker in Charge, were political prisoners. In this should be the recognition that racialized hyperincarceration in the US has delivered political prisoners by the millions. Prisons are the other of airports, the nonplace that denies access to all places. Last night’s protests must also orient themselves toward that fight rather than the patriotic restoration of a liberal regime which helped engineer those prisons. Indeed, if there is a striking feature of the political field underscored by last night’s events, it is the dissolution of the left-right spectrum’s explanatory power. The Brexit vote, or SYRIZA’s forced alignment with Europe’s banks, have shown the weakness of that political map. Left and right now largely stand for different approaches to managing the crisis; neither is working, hence the disarray. In its place, the evident dynamic is between the included and the excluded: those who can be internalized to the logic of state and capital both, and those who cannot. The border, the wall, is both reality and figure for this arrangement, though it is no less visible in the banlieues ringing Lyon or the shantytowns of Sao Paulo. It is not a matter of choice but necessity. These exclusion zones will be a basis of emancipatory struggle if there is to be one at all.